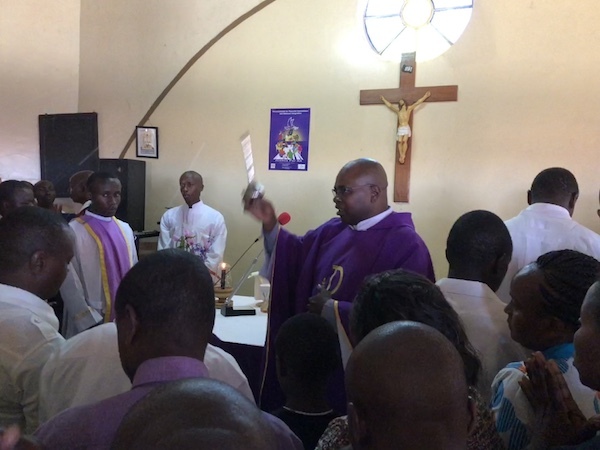 Father blesses the offertory procession in Meru, Kenya. Today, we had the great privilege of worshipping and receiving the Eucharist with the parish community of Christ the Savior Catholic Chapel in Meru, Kenya. When we drove the short distance to the parish and entered through metal gates, I did not understand that we were actually entering the grounds of a Women’s Prison. In fact, it wasn’t until halfway through Mass, during the offertory process, that I learned that the women form a part of the parish congregation, worshipping at a morning mass of their own. From the moment we entered the open-air chapel, my heart was filled with joy. Resplendent in Lent’s purple wardrobe, the chapel was actually quite simple. Its sturdy wooden benches weren’t quite sufficient for Sunday’s standing room only crowd of worshippers who flocked to spend Sunday together in prayer. We arrived ten minutes early and were ushered into seats of honor at the front of the already packed congregation. Around us, song rang out in luscious four-part harmony with nothing but a spirited keyboard for accompaniment. The entire congregation seemed to form a choir that sounded to me like angels greeting and welcoming us. It’s clear to me by now that Kenyans love song, and in Church, singing is praying twice! So, though I didn’t know the Swahili lyrics, I did my best to mimic the praise and worship. The singing and dancing: Traditional dancers accompany the priest during the opening and closing processional and also help bring up the gifts at the offertory. The dancing is respectful, but also an integral part of the liturgy. The proclamation of the Word: Many people are a part of the Kenyan liturgy. The lectors proclaim with spirit, precision and joy as if giving their fellow congregants a precious gift. The homily: I have yet to learn the name of the amazing pastor who welcomed us and spoke directly into our souls, but Father’s homily was among the best I have ever heard preached. And he preached in a foreign language! The prayers of the faith: A team of congregants came forward to offer the prayers of the faithful. This and so many other liturgical roles show that this congregation loves to have a part to serve in the Mass. Lenten reflection: After Communion and immediately before the final blessing, a short reflection by a parishioner focused on a Lenten campaign that is taking place in Meru, focusing on “Reconciliation for Peaceful Coexistence and National Integration”. Given Kenya’s recent political upheavals, the gentleman who reflected called us, Christians, to embrace the path of peace and to be active in leading our families, communities, and society toward the path of peace. Lenten collection: A “second collection” took place after Communion, with parishioners again forming lines and being invited to come forward and give Lenten alms. The priest invited us to connect this almsgiving with any fasting we had done during the past week. The symbolism of this moment—of poor people giving of their meager livelihood—was not lost on me. How much work I need to do to be as generous in spirit as they are! Unbound Presentations: Our Meru Unbound Project Coordinator Marius introduced our fellow traveler Neveda to come forward for a brief reflection. Neveda, a member of Unbound’s Kansas City staff, spoke from her heart, thanking Father and the congregation as well as the people of Kenya for welcoming us with such open hearts. Angels! A group of sponsored children came forward to recite a poem for us and sing us a song. Looking at these children and knowing the hope that Unbound gives them for bright futures brought pure joy to my heart. All too soon, it was time for us to process from Mass and head off for the rest of our last day in Meru. As we said goodbye to the sacred space, I carried Father’s words in my heart. As part of his homily on the gospel, Mark 9:2-10, Father reminded us that we must be witnesses of God’s goodness, transfigured by the love of Christ to serve the world around us. Father called us to love with creativity, with compassion and to recognize the presence of God in each of God’s children, especially among those most in need. Father called us to be propelled by this love… propelled into action. Today and every day for the remainder of Lent, I will meditate upon this call to love, an active love that does not rest in comfort but rather a love that goes to the margins and asks what she can do to help, to serve, or simply to accompany. We don’t need to travel to a foreign country to find someone around us who lacks love. The “margins” may be in our home, parish or neighborhood. How can our love transform a world that at times feels so broken? I have to believe that one heart at a time, each of us has the capacity and the responsibility to be a part of the solution. “Love one another as I have loved you,” Jesus taught. As our journey winds to a close, how will listening to Jesus transfigure my heart? Who needs my love today? Do you have the capacity to change a life through sponsorship or even a small donation? Please consider joining the mission of Unbound. Visit www.Unbound.org for more information.